This is my favorite beans recipe. People in Aden have beans for breakfast and supper EVERYDAY. This is a delicacy, since kidney beans are more expensive in Aden. 20 oz. can of kidney beans, drained. I love the BASE for this dish–you can pracitically use it for any beans from navy beans to fava beans. For the base, sautee the onions in the oil and add the garlic and jalapenos. When the onions are golden brown add the tomatoes and some salt and wait for them to soften. Once they soften add the tomato paste and half a cup of water (you can use some of the water that you cooked the beans in). Let the sauce thicken. Add the beans and add some more water if you like–we like it nice and thick. Let it simmer for about 4 minutes. Pour the ghee on top and sprinkle the cilantro for garnish and serve with bread. 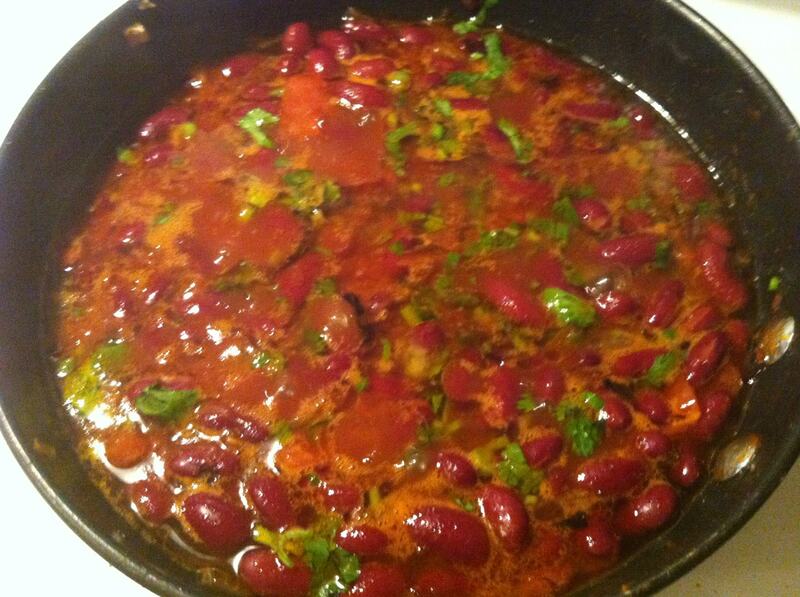 I made this in the Yemeni Madra and serve it in it as well, so from the stove to the table it goes. Tasted just like mom’s. I did add some crushed cumin seeds at the end, before adding the ghee/samn. Thanks for sharing. Looks delicious! My mum makes it in a similar way, we add chili powder though. Tastes nice with buttered hot flatbread! We sometimes add chilly sauce to it. It’s just dried red chilly pepper that we soak overnight and then place in a food processor and refrigerate. How do you cook the beans? I usually buy the canned ones, and if I do have time to boil my own i usually soak them overnight and then boil them. If i am boiling my own and in a hurry, i use a pressure cooker. Thank you so much for this recipe! It was delicious! I have a Somali friend who showed me a picture of a red kidney bean dish he made and I wanted to try something similar. I added a pinch of cumin seeds and turmeric while I was frying the onions and ate it with parathas. I didn’t have any ghee so I’ll definitely look forward to trying the dish again with that. Is jafai ghee the same as the brown yemeni ghee? Thank you. Not necessarily. It really depends on the flavor not the color. I’ve seen ghee from other places that are brown too.